LA Unified school board member Monica Garcia with two students from KIPP Raíces Academy School. The National Blue Ribbon Schools award given out each year by the federal government is considered among the highest honors a school can achieve, and of the 335 Blue Ribbon schools in 2015, only one was from LA Unified. 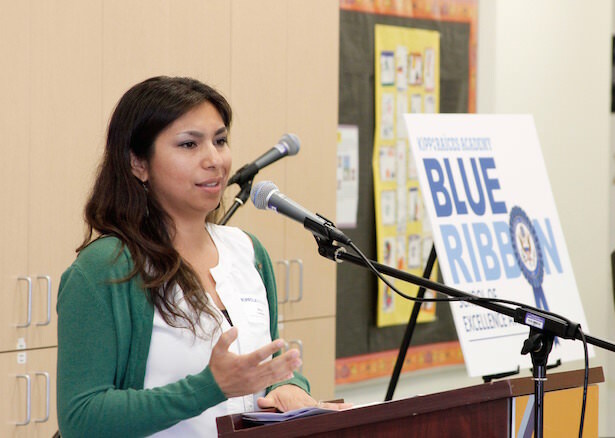 That school, KIPP Raíces Academy School in East Los Angeles, celebrated the award today in a special ceremony that was attended by numerous local politicians and LA Unified administrators, including school board member Monica Garcia, who was the event’s keynote speaker. “America is better and safer and stronger because KIPP Raíces is in East LA,” Garcia, who grew up just a few blocks from where the school is located, told the crowd. The elementary school received the award in October but formally celebrated it today. The KIPP (Knowledge Is Power Program) network operates 13 LA Unified independent charter schools in South and East Los Angeles. The school is 96 percent Latino, and 90 percent of its students qualify for free or reduced price lunch. 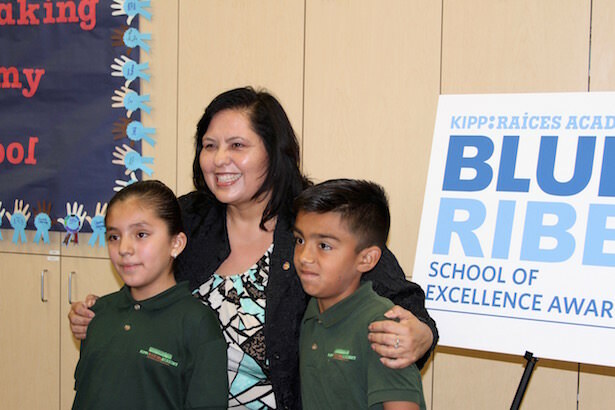 The Blue Ribbon award is given to both public and private schools, from elementary through high school levels, and KIPP Raíces was honored as an Exemplary High Performing School, essentially marking it as one of the top schools overall in the nation. KIPP Raíces poverty and English learner levels are higher than the LA Unified average, but its 2015 Smarter Balanced standardized test scores were far above the average for traditional LA Unified district schools. Seventy-four percent of its students met or exceeded the standards in English language arts, and 79 percent met or exceeded standards in math, compared with a 33 percent average in English and 25 percent in math for LA Unified traditional schools. The school opened in 2008, and its founding principal, Amber Young Medina, recalled the challenge she faced when trying to recruit students for a school that at the time did not yet have a physical location. Young Medina, fighting back tears through her speech, said that all along the Blue Ribbon award was her true goal. “My goal was for [KIPP] to be a model of excellence and ensure its students were achievers and were on the path to college from the beginning. My secret goal, if I’m being honest, was for it to be a Blue Ribbon school, because that is the highest honor. And here we are,” she said. A podium and microphone had been set up for all of the guest speakers, but Garcia — well-known for her enthusiasm and strong projection when speaking in public — went nowhere near it, and it is doubtful any of the 75 or so invited guests had any trouble hearing her. “It’s completely OK to cry, because as a daughter of East LA I feel extremely proud to stand with President Obama and Gov. Jerry Brown and [former] Supervisor Gloria Molina and say that the best is in East LA. And today when we celebrate our achievers, we are celebrating this amazing community that wants every child to get to graduation and wants every family to feel connected and that they belong. So, well done KIPP!” Garcia said. Other guests in attendance included Molina, board member Ref Rodriguez, LAUSD Charter Schools Division Director Jose Cole-Gutierrez, InnerCity Struggle Executive Director Maria Brenes, Families in Schools President and CEO Oscar Cruz and Teach For America Los Angeles Executive Director Lida Jennings. Mirna Cardenas, a parent of one current and one former student at KIPP Raíces, spoke about how much the school has meant to her family and how it stretches her to keep up on current affairs. “I have to keep up with [my daughter] by watching CNN and listening to NPR because what she’s learning in her class I’m watching on TV that same day, and she’s wanting to know what I have to say about that topic. So she kind of keeps us on our toes,” Cardenas said. After the ceremony, Garcia could only recall one other school — Francisco Bravo Medical Magnet — from her East LA district having won a Blue Ribbon award since she was elected to the board in 2006.